Like many parts of the U.S., downtown San Diego is experiencing tremendous growth and revitalization. Although ultimately beneficial for the community and residents, an unfortunate result of the building boom is a loss of the city's connection to the past. 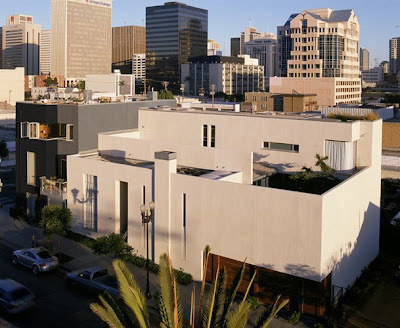 In this project, the architect took a 50 x 100-foot infill lot and developed two housing prototypes for San Diego's urban core - a small-lot convertible house and a new urban mixed-use mansion. Conceived as a way to lower housing costs in San Diego, the site's two convertible units are on 25 x 25-foot lots, with the lower levels designed as rentable office or living space, allowing the owner to subsidize the cost of the mortgage. The "T" shaped upper level of the larger unit is dedicated living space, which shapes two courtyards neatly hidden behind the streets' walls. The lower level houses an architecture office. The units respect the small scale of the neighborhood and add elegance to the city's streetscape.